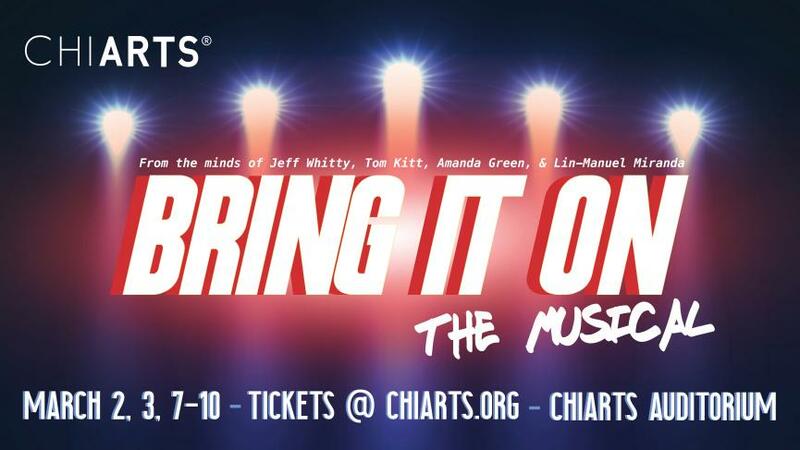 This March, ChiArts presents Tony Award nominated, BRING IT ON: THE MUSICAL. With music by Tom Kitt and Lin-Manuel Miranda, and lyrics by Lin-Manuel and Amanda Green, BRING IT ON: THE MUSICAL will be a vocally explosive experience. In addition to a “Best Musical” Tony nomination, the show received a nod for “Best Choreography” which is showcased through incredible cheerleading routines and high energy musical numbers. 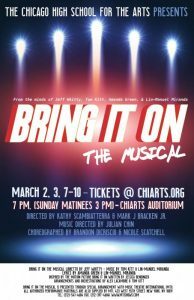 BRING IT ON: THE MUSICAL will run March 2, 3, and 7-10, with performances beginning at 7:00 PM and Sunday matinees at 3:00 PM. All performances are in the ChiArts Auditorium. ChiArts aims to create content that pushes boundaries and we cannot wait to show audiences the versatility of our scholar-artists in this spectacular production. TICKETS ON SALE NOW! We’d HIGHLY recommended purchasing in advance as we are expecting to sell out.